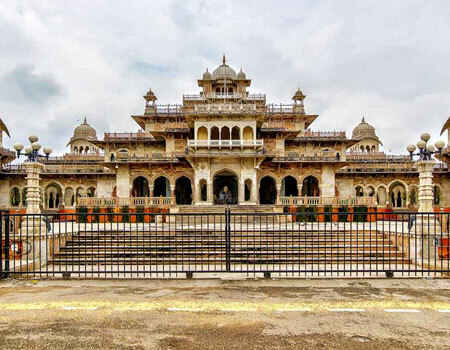 The Albert Hall Museum is situated in the capital city - Jaipur, Rajasthan. The museum was erected in the year 1876 amidst the Ramnivas Garden. Popularly known as the Government Central Museum, it was built under the supervision of Lieutenant Swinton Jacob. Despite being one of the oldest museums in Jaipur City, the building till date recalls the majesty of the Maharajas of Jaipur. It is also said that King Ram Singh wanted to construct this museum for his personal use. The architectural style of the Albert Hall Museum is unique in itself. No other building in the city matches the architecture of this museum. It has been built in the Indo-Sarcenic style of architecture. It is a living testimony to the rich architectural heritage of India. The striking displays of the Albert Hall Museum never fail to fascinate the visitors. The miniature paintings and the portraits of the kings enhance the beauty of its walls manifold. Metal work, jewellery collection and brass articles are also appreciable. Apart from the numerous courtyards, towers and archways it houses, some other specialties of the Albert Hall Museum include intricate woodworks, beautiful carvings, ethnic costumes of the former kings and clay wares. The visitors can visit the museum any time between 10.30 in the morning to 4.30 in the evening. They will be amazed to see the aristocracy of the erstwhile Kings of Jaipur resplendent till today.